The thought of Hog's Breath while you're eating might not be particularly appealing and I must admit I hesitated dining there for that very reason, but I do have an adventurous side that believes you should not judge a book by its cover – although you'll sell a lot more books if you do have a great cover. 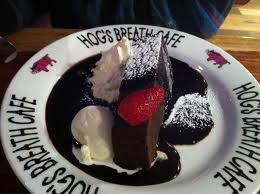 So, my job is to sell you on the idea of eating at Hog's Breath Café because there's nothing stinky about the place really, and the food is fit for a hog, and his hogette and tribe of piglets. Sounds like Aussies are a bunch of porkers. We burn it all off with all that sport we sit and watch, I mean play. Hog's Breath is a great choice for family dining. The kids can amuse themselves watching extreme sports videos, (see what I mean, although I couldn't peel my eyes away from the screen either) and children under 12 get free soft drink and 2 scoops of ice cream with their choice of cheese burger, chicken nuggets, steak, fish and curly fries, potato gnocchi, or pasta. Vegetarians are catered for, but I'm going to tantalise you with my choice from the menu. The Beef and Vegetable soup was delicious. It had chunky pieces of beef which were very tender. There was an interesting blend of spices which gave it a bite. It came in a large bowl which was very filling. The chicken tenders were delicious. They were a generous helping and large in size, consisting of chunks of chicken breast coated in a crispy covering of very fine breadcrumbs and cooked to golden brown. The side dish of mustard dipping sauce was also delicious and complimented the chicken tenders beautifully. There was also a splash of sweet chilli sauce on the plate. 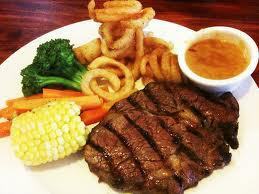 The prime rib is famous for the special slow cooking process that takes up to 18 hours. I wasn't disappointed. The prime rib was cooked to perfection, very juicy and tender. It was easy to chew and very flavoursome. The vegetables were nicely cooked with a crispy bite to them and the corn was sweet and delicious. The curly fries are of course the best fries in the universe and cooked to a golden crisp. The Mississippi Mud Cake was slightly warm and served on a large plate in a river of chocolate sauce with a generous scoop of ice cream and dollop of cream. It was a decent portion of cake beautifully presented with a fresh large half cut strawberry on top. 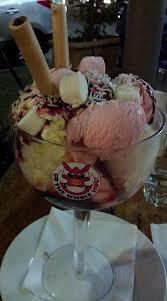 The Rocky Road Sundae came in a very large scooped glass and was layered with chocolate biscuit cake, strawberry and vanilla ice cream, drizzles of strawberry and I think caramel sauce, whipped cream and marshmallows at the top. It was very rich but delightful. Of course there's a lot to choose from the Hoggie menu that will make you salivate like a hog such as flame grilled ribs, super juicy burgers, sensational salads and seafood and there are hot seafood and mixed grill towers for two. Hog's Breath offers Frequent Diner cards so you can save 25% on each meal, although you'll find the prices reasonable to start with. $50 will buy you a five year membership. 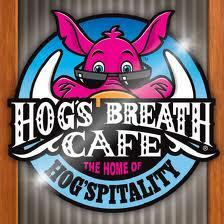 Give Hog's Breath a try for great food and value. You won't be disappointed. The establishment the writer went to must have been a better example of this chain. We ate at the Ballarat Hogs Breath recently and all of us were very disappointed at the quality of the food. Would have been better off eating at the local RSL. If you're not too fussy give it a go. Hopefully your experience will be better than ours. I agree with caz13. I ate there a few times years ago and it was fantastic. Then I had 2 successive meals there in different Hog's Breath restaurants and they were very poor. I haven't been back.